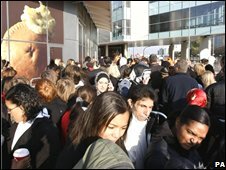 Large crowds gathered in west London for the opening of Europe's biggest inner-city shopping complex. The Westfield Shopping Centre boasts more than 1.6m sq ft (150,000 sq m) of space, the size of 30 football pitches. Opening the centre, mayor Boris Johnson described it as a fantastic achievement which would persuade people to come to the shops, despite the credit crunch. Tens of thousands of people are expected to visit the White City complex throughout the day. Mr Johnson added that many Londoners had made a "prudent decision to give Thursday morning a miss and come shopping". During the ceremony, singer Leona Lewis performed five songs including Forgive Me and Bleeding Love. She told the crowd: "I'm so excited to be here because, I don't know about you guys, but I'm a bit of a shopaholic and I'm performing back in London, which I'm really excited about. "So this is the perfect venue for me." Marks & Spencer chief executive Stuart Rose also sang the praises of the complex, for which he predicted a successful future despite the economic downturn. "I'm optimistic for this centre, which I think is fabulous," Mr Rose said. "If we make a date to come back here in two years' time, I think it will be a success." 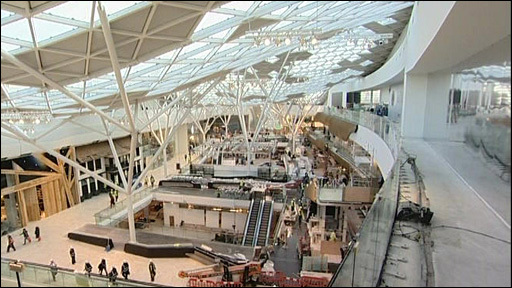 Westfield is the UK's third largest shopping centre after Gateshead's MetroCentre and Bluewater in Kent. Among the 265 retail units are many of the UK's high street giants, including Marks & Spencer, Debenhams, Next, House of Fraser and Waitrose. About 80% of the stores are fashion outlets, with the site featuring 40 luxury brands including Louis Vuitton, Mulberry and Prada. Mary Portas, star of BBC 2 television show Mary Queen of Shops and a consultant for the centre, said the complex heralded a new approach for UK retail centres. "The juxtaposition of luxury, high street and even supermarket - nobody has actually done that before but it makes enormous sense," she told BBC News. "I think the scale of it feels like we're in a mini-town." The developers say 99% of the retail space has already been let, with 80-90% of the building open for the launch. The centre took 13 million man hours to build, has 96 escalators and is expected to have created about 7,000 jobs - with 1,000 going to local residents. Bosses estimate 21 million people will visit each year. Such figures have prompted warnings from local politicians that White City and Shepherd's Bush could experience gridlock, as shoppers visiting the site vie for parking spaces. Leader of Hammersmith and Fulham Council Stephen Greenhalgh said the authority might bring in certain restrictions in the area. "We might have to introduce residents-only parking and with some kind of visitors' scheme. "That can be delivered via emergency measures in a couple of months."